James Bond – Die Another Day is on TV at the moment. Technically, I’m watching it, but despite the fact that it is now the film’s climax — Halle Berry appears to have drowned! Oh no! Will she make it?? Please Halle! Come back to us!!!!! Oh wow that was a close one. Don’t worry, she’s coughing and spluttering now and delivering an obvious one-liner. Whew! Where was I? Oh yes, this is the climax, but I appear not to be that gripped by it. This is in spite of the fact that the film opened with spies big-wave surfing into a fortified North Korean coastline in order to blow up ludicrous amounts of stuff, and recently had genetically altered characters fist-fighting while deadly laser beams sliced around the room (Halle also needed to have her helpless heiney saved then). It’s so darned exciting that I just can’t not take my eyes off it. So, yes, there is almost no tension when you don’t care about the characters, and no amount of explosions can get you to care for a character. The big blockbuster mistake. By the way, the two ‘Bond girls’ are now swordfighting in tank tops in a jet liner that is being torn apart by a sun-beam-shooting space satellite. Did no alarm bells go up when they were writing this? Can I allow that to sink in for a moment. 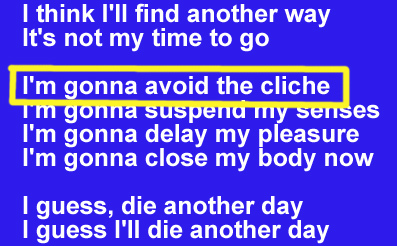 I’m gonna avoid the cliche? That was them avoiding the cliche? 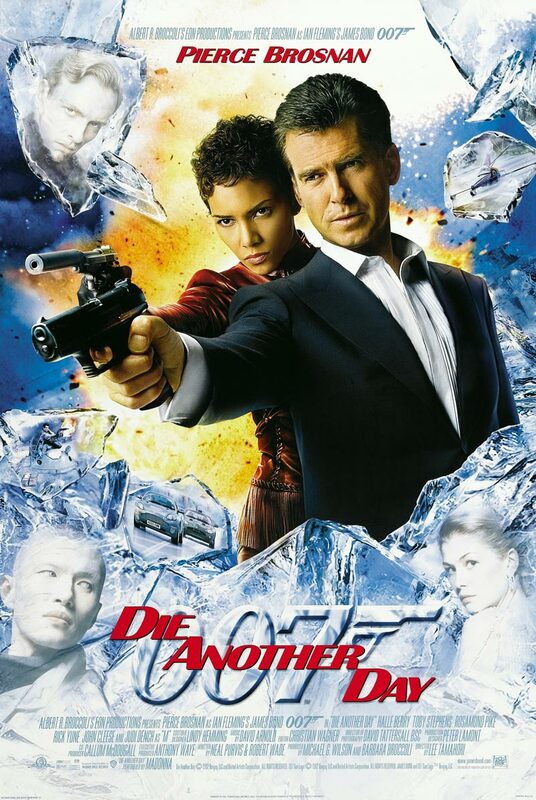 I’m gonna avoid the cliche and give Die Another Day two thumbs down. Mamma Mia! that was a fine piece of cinema! OK, so I don’t like Disco in general or Abba in particular. I hate musicals most of the time. So we watched this fast-forwarding all the songs, because someone lent us the DVD and insisted it’s worth watching. They were wrong so wrong. "Look how much fun we all are". Clearly trying to appeal to the divorcee market, the cast is packed with plastic surgery and silver foxes. I also have no idea why Colin Firth (as much as I like him) was cast as the spontaneous guy, or why he spent the 90 minutes impersonating Dudley Moore from Arthur. The best thing about musicals is how jarring most of them are. It’s like trying to shift gears with no clutch. In the middle of a desperately heart-felt conversation, what could be more unwanted than a pace-killing musical number, in which a character tortures twenty seconds of dialogue over a full three minutes? But off they launch, while character number two tries to look busy. Character number two is always good entertainment under such circumstances, as long as you can block out number one. The awkwardness, the attempt to appear engaged in something so plastic and tedious. It’s hell, but it’s about the best entertainment on offer if you’re stuck watching a faux-true-life pageant. C'mon everyone! Head for the pier! Or perhaps there’s one of those ‘celebratory-of-life’ scenes in which the entire beach breaks out into synchronised chorus and heads for the pier so that someone can get pushed in in a display of spontaneous choreographed joie de vivre. This happens at least twice in Mamma Mia (the pier and everything, not just the everybody-somehow-knows-the-words thing). Well, the best bit for me is right after the big finish, when the stage curtain is supposed to fall while the scene changes, and everyone stands for a while with a look on their faces that says, ‘There is no curtain, this is a movie’. And so somehow everyone awkwardly returns to normal as though they had previously been under extra-terrestrial mind control for the last four minutes, and are completely unaware that they had all been dancing. I love watching the pieces of gearbox whistling through the air as they try to make that transition. "Don't tell mom I'm jumping on the bed"
Musical numbers that try to be integrated into normal story life (i.e. those supplanting normal conversation, as opposed to those on a stage or exploring a character’s thoughts) are best seen with the sound down. It is wonderful watching actors trying to do something expressive with themselves as though in a conversation, because the body language is so daft and exaggerated. 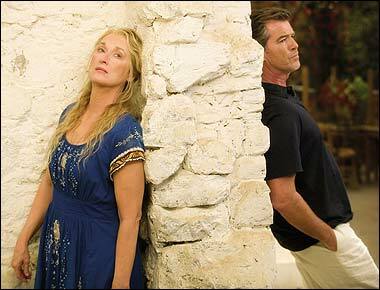 Meryl Streep is supposed to be an independent free spirit in Mamma Mia, so she spends ages cavorting around and acting thirteen while she sings. "We're kind of lovesick and stuff. I bet we'll hook up by the end of this"
And in duets, you get those bits where both singers lean their backs against either side of the same wall, so that they can tell the viewer that they’re communicating now. And then there are the poses that mean ‘I’m emoting’ or ‘Look how much fun this is – live vicariously through my enjoyment of this!’ It really is quite funny. Anyway, it’s a desperately stupid movie. I have no idea why so many of you liked it. Obviously characters breaking into song must not jar you out of any illusion that you’re not watching a movie, as it does me. Lucky you. But for such an expensive excuse to don retarded Seventies disco-glam costumes, and a cheap sewing together of Abba songs with such a tepid plot, Mamma Mia gets a 1/10 from me. Whee! I'm just so darned *obviously* free!! 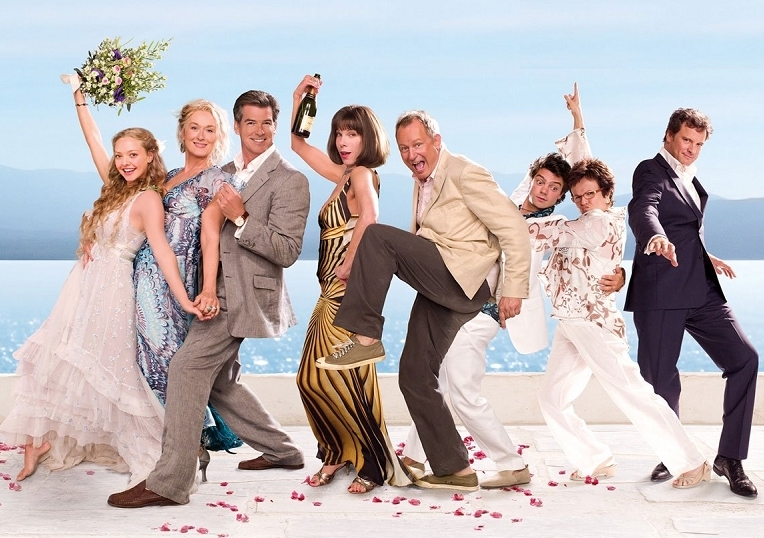 For having the boys dress up in stupid seventies outfits for the end credits, Mamma Mia gets upgraded to 2/10. Of course, what we’ve come to expect from Disney is non-stop quality. They’d never resort to endless straight-to-video spin-offs of everything that had a modicum of success. They’d never make cheap, thoughtless, computer-animated TV just because it’s lucrative. They’re not that kind of soulless machine. But everyone’s prone to bizarre lapses in thinking, and in Disney’s case, that is their magnificent Fast Play feature installed on their DVDs. Everyone (everyone except DVD production houses) recognises that the most annoying thing about commercial DVDs is the amount of time that it takes between sticking in the DVD and starting the movie. Disney’s Fast Play is not designed to do anything about that. But it’s name suggests that it does, and it’s name has absolutely nothing to do with the thing that it does do. 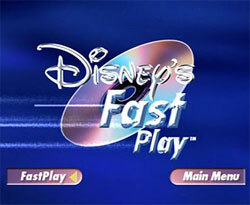 Fast Play bypasses the need for you to press ‘play’ once you’ve reached the menu — not an especially strenuous stage — but Disney will be darned (and they will anyway) if they’ll let you get to that menu in good time. Right where the ‘Play the Movie’ menu ought to be, you’re given the option to choose your language. Why this couldn’t just be an industry-standard flag icon on the main menu, I’ll never know. Nevertheless, you the parent needs to do some choosing here, right before you flee whatever torture Disney has lined up. Here comes the important stuff. Warnings about who-knows-what that nobody ever reads. I’m sure it covers the studio in the case of something-or-other. Imagine if your software packages insisted on getting you to opt in to the T&Cs every time you started up. Imagine your mp3s were each prefaced with a lawyers voice telling you how naughty you would be if you gave copies to all your friends. Annoying? Why, yes, it would be. For a full 45 seconds, Disney allows itself the indulgence of telling us how great it is. Perhaps they aren’t aware that I have seen The Jungle Book 2, The Suite Life of Zach and Cody, and My Friends Tigger and Pooh. Maybe the message that there’s only one Disney is supposed to inspire a sense of relief in us? As the itchiness begins to set in, the viewer is given the opportunity to jump to the conclusion that clicking on Fast Play will end the madness and get you to the movie. Paradoxically, Fast Play gets you there slower. If you want to get there quickly, you have to choose not-Fast-Play, and click the menu button. Having misinterpreted the Fast Play instructions, Disney now has its captive audience. The Enchanted trailer is both prefaced and followed by some more shameless corporate self-congratulation. It goes on for 3 full minutes. You’ve bought the DVD. 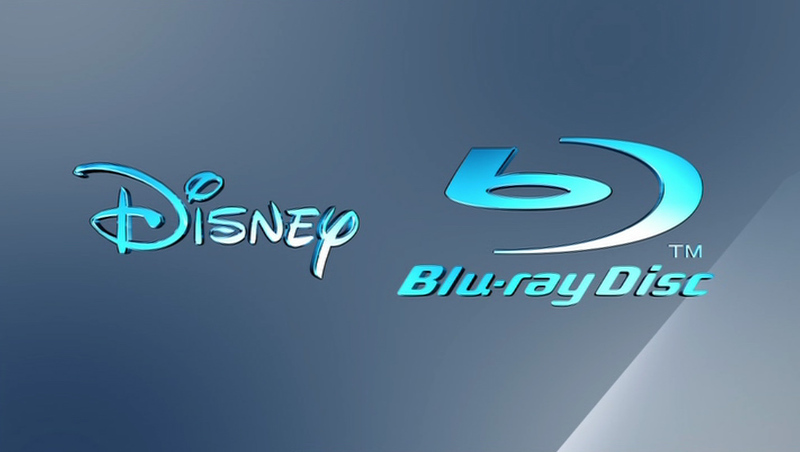 Disney would like you to know that you really should have bought the Blu Ray. It’s much better (they show you how much sharper and more astounding it is than feeble DVD quality, even though you’re watching a DVD). Allow the dissatisfaction and envy to descend. It’s what it’s all about. You’ve seen it. You probably own it. But do you have the Platinum Edition? Disney Logo animation. Pixar Logo animation (plus cute Wall-E interaction – Pixar is Disney’s only saving grace, isn’t it?). Wall-E trailer. Actually, this is probably an occasion on which Disney needs to display its logo yet again. I for one still cannot believe that the frequently appalling Disney are in any way connected with the uniformly outstanding Pixar. They need to keep reminding me of that. Because kids really dig Freemasonry. If at this stage you’re still confused as to whether you’re watching a DVD that is made by Disney, a Disney DVD may be all the intellectual stimulation you’re ever going to handle. You have to watch out at this point. If you’ve been working the ‘skip’ button for this long, trying to find the movie, you’ll be forgiven for thinking that this is just another logo page. So you’ll skip it. But because Fast Play is such a wonderful idea, they’ve removed any division between the movie and the guff beforehand. So when you skip, you don’t find the useful stuff on the other side of the logo, you find scene 2 of the film itself, and so you have to skip back again to find out what happened in scene 1 (but not before you’ve watched the Disney logo again). Spyglass gets its 15 seconds in the sun. Mercifully, Underdog has only one of these production pages. Some movies seem to have 5 or 6. By step 12, adding 4 more might have led to suicide, so they left it at one. Is anyone still watching? After approximately 11 minutes and 11 seconds since you selected your language (and where any sane person would have put a ‘Play the Movie’ button), the movie has begun. Would you have called this DVD feature Fast Play? And you’ve been trusting your kids to people who do? ?